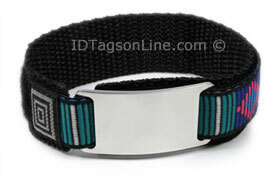 DNR medical Id Bracelet, DNRIDSP01 (ID Tag size 1-5/8" x 7/8"), is made from .062" thick premium grade Stainless Steel. This medical ID bracelet plate does not have any logos. High reflective quality of the mirror finish of the medical Id Plate is combined with the deep engraving of the medical information. This creates exceptional contrast of letters and high durability of the product, which is easy to read. Ornamental wrist band is universal and fits any wrist's size up to 8.0". Metal ID tag will never touch your skin and will provide complete mobility and comfort. Each bracelet comes with single Medical Emergency wallet card.